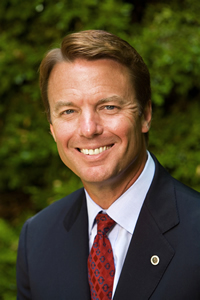 John Edwards' bold ideas have shaped the debate in this election. Whether it�s creating universal health care or halting global warming, ending poverty or ending the war in Iraq and restoring America�s moral leadership around the world, John has led with the boldest and most comprehensive plans for overcoming the challenges we face today. John is the one candidate willing to speak the truth about what�s going on in Washington: big corporations and special interests have taken over our government and taken the power away from the American people. And he knows there�s only one way to get it back: to stand up, take them on, and beat them. John is ready for this fight � because fighting special interests on behalf of regular, hard-working Americans is what he�s been doing his entire life. John is a self-made man who was born in Seneca, South Carolina and raised in Robbins, North Carolina, a small town in the Piedmont. Growing up, John learned the values of hard work and perseverance from his father, Wallace, who worked in the textile mills for 36 years, and from his mother, Bobbie, who ran a shop and worked at the post office. Working alongside his father at the mill, John developed his strong belief that all Americans deserve an equal opportunity to succeed and be heard. A proud product of public schools, John was the first person in his family to attend college. He worked his way through North Carolina State University where he graduated with high honors in 1974, and then earned a law degree with honors in 1977 from the University of North Carolina at Chapel Hill. For the next 20 years, John dedicated his life to representing families and children just like the families he grew up with in Robbins, who were being victimized by powerful interests. Throughout his career, John found himself on one side of the courtroom with an army of corporate lawyers on the other. Every time, they thought they could win. But they were wrong. Because John beat them, again and again, on behalf of hard-working families facing the darkest moments of their lives. Through his career, he helped families overcome tremendous challenges, and earned a national reputation as a forceful and tireless champion for regular, hard-working people. In 1998, John took that commitment into politics, to give a voice to the kind of people he represented throughout his career. Without taking a dime from lobbyists or political actions committees (he never has), John ran for the Senate and won an upset victory, unseating an incumbent Republican who was a part of the corrupt Jesse Helms political machine. In the Senate, Senator Edwards continued to be a champion for regular, hard-working families, taking on critical issues like quality health care, better schools, protecting civil liberties, preserving the environment, saving Social Security and Medicare, and getting big money out of politics. As a member of the Select Committee on Intelligence, Senator Edwards worked tirelessly for a strong national defense and to strengthen the security of our homeland. He authored key pieces of legislation on cyber, bio, and port security. Senator Edwards brought his positive message of change and fighting for regular families to the 2004 presidential primaries. During the primary season he spoke about the Two Americas that exist in our country today: one for people at the top who have everything they need and one for everybody else who struggle to get by. This powerful message resonated with voters all across America. After the Democratic primaries, Senator John Kerry picked Senator Edwards to serve as his running mate in the 2004 general election, and Senator Edwards crisscrossed the country and campaigned tirelessly on Senator Kerry's behalf. Today, he is running for president on behalf of the people he grew up with: good, hard-working Americans who want nothing more than to leave a better life for their children � just like their parents did for them. He is the former Director of the Center on Poverty, Work, and Opportunity at the University of North Carolina at Chapel Hill. Senator Edwards and his wife, Elizabeth, whom he met when both were law students at Chapel Hill, were married in 1977. They have had four children, including: their eldest daughter, Catharine, who is attending law school; nine-year-old Emma Claire; and a seven-year-old son, Jack. Their first child, Wade, died in 1996. Out of the users that have visited this site 1260 out of 65123 say they would write in John Edwards if they knew the write in would help get him elected for president. (Not every candidate is registered/eligible for write in votes in every state).